It sounds like you put a lot of thought into this aspect of your stories, how do you view the relationship between science fiction and politics? You know, the thing I think can be so great about SF is how it can do the big political thing – it can re-examine our assumptions, it can take a real sort of counter-culture punch at things – and get away with it, because it’s only sci fi! And I have this sense that 1960s science fiction does exactly that; but then, at some point post-1984, post-Gibson, it all changes, or at any rate we see a lot less of that. I am, to a large extent, a political writer. Osama, my recent novel from PS Publishing, is obviously political, but not perhaps in the way people would expect. I tried to do that “it’s only pulp, really” thing with it. It’s a noir detective novel. Which I think is the only real way we can make sense of this narrative of terrorism and the whole “War on Terror” thing – it seems to me to come from some alternate history pulp novel, in so much of its iconography and the way it is told, the way it is spoken. I love having fun writing, so the politics is, hopefully, underneath that – whether it’s taking the piss out of a few SF writers in a short story like “The School”, which I had to self-publish, or taking on the whole thing about Wikileaks and having a lot of weird SF fun with it in “Enter The Dragon. Later, Enter Another.” – which I also published on my blog. I have the feeling we’re in a very conservative environment, an American-conservative environment, when it comes to genre fiction now. I suspect I will end up self-publishing more of these stories as magazines go for safe. I don’t like safe. I don’t have a lot of time for it. 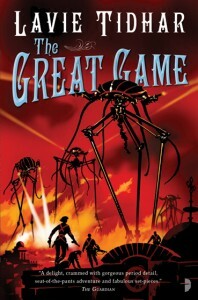 In The Great Game, you bring in a number of literary and historical characters. How did you choose who to include? Well, you kind of throw everyone in. I had fun doing the village in the first few chapters – a sort of home for retired detective characters really. Which itself resembles the village from The Prisoner. Part of the fun of steampunk, I always thought, is that game of spot-the-reference, so it’s there if you want it, but doesn’t have to be. I think Miss Marple has a cameo there (holding a Gatling gun and firing at a Zeppelin!). 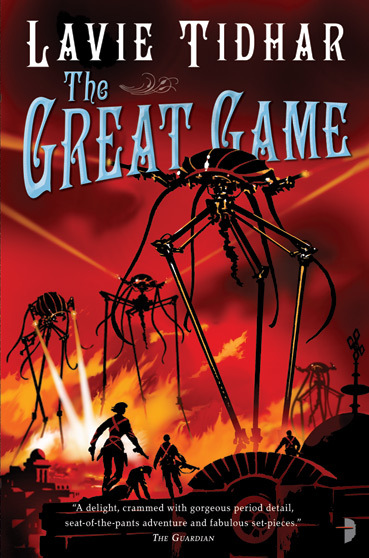 There are elements of the classic spy novel in The Great Game, were you a fan of those books growing up? Did you read anything in particular to get a feel for how to approach your writing? Sure, I’m a huge Le Carre fan – the whole Miss Havisham scene is an obvious, I think, reference to the Connie Sachs scenes in Tinker, Tailor, Soldier, Spy. And I love Adam Hall’s Cold War thrillers, which are a lot more action-oriented than Le Carre. They were a prime influence on my novella An Occupation of Angels earlier on. You travel a lot. How does visiting other countries affect your writing process? I have to admit where I am really makes a big difference to what I write – I went through an obvious “Vanuatu period” when I was living in Vanuatu, and a longer “Lao period” when I was living in Laos. More recently I spent a year and a half in Israel again and that’s been instrumental for the next big project I’m working on. Sense of place is really important to me – not just to visit but to cook in, to speak the language of, to drink the beer and argue the politics of a place. There is what I heard called “Gap Year SF” – you know, this sort of tourist-vision of “exotic” places in science fiction, but I have little interest in that. I’m bad at travelling. I’m better I think at just settling down somewhere for a while. After living in all these places, if you had to choose one place to spend the rest of your life, where would it be and why? The World SF Blog showcases science fiction writers from around the world and you recently started the World SF Travel Fund, a charity that helps international members of the science fiction, fantasy, and horror community travel to major genre events. As someone with their eye on authors from around the world, what are you noticing regarding non-Anglo speaking writers? I think it’s not so much the industry but the Internet – the fact that the means of communication have radically changed – which gives people more access. Translations are still pretty much non-existent – though a particular hat tip to Ken Liu, who’s been doing an amazing job translating Chinese short stories recently. But you know, when I look over the last 3 years (since we launched the World SF Blog and published The Apex Book of World SF) it does feel like something has happened. I’d like to think so, at any rate. What has your attention these days? I’m pretty busy with a whole raft of projects – February has 3 books coming out, The Great Game in mass market; a picture book, Going To The Moon, about a boy with Tourette’s; and, hopefully, The Apex Book of World SF 2. At the moment I’m finishing a couple of short stories for a couple of anthologies, and kind of easing into 2012. It’s going to be a busy year I think. Is there anything you wish someone would ask you but they never do? No one ever asks me about poetry, that’d be kinda nice. Poetry doesn’t get enough attention in general and I bet not many people think to ask science fiction writers about it. Who are some of your favorite poets and why? I’m so glad you asked me that! I would say Philip Larkin is one of my favorite poets. T.S. Eliot, naturally. I have a soft spot for Bukowski, and I’m a big fan of Wendy Cope, whose technical skill is astounding to me. But I could go on and on – the early Yehuda Amichai, Sylvia Plath, Allen Ginsberg, some of Frost. I love the Hebrew poetry in “Song of Songs,” which I think is magnificent (none of the English translations really do it justice), and equally, Shakespeare’s sonnets are just as remarkable today as when they were written. I adore Basho, as much for his travel narratives as for his poetry. I have a fondness for the British war poets though I have never had that much time for the Romantics, with the exception of Blake. Does poetry factor into how you approach your fiction? I started off as a poet – my first book was 1998 Hebrew poetry collection, Remnants of God. These days I don’t publish poetry much, but tend to incorporate poems into many of the short stories and the novels – you can find them in Osama, for instance, or in the short story that preceded it, “My Travels with Al-Qaeda,” while my story “Shira” — which means “poetry” in Hebrew — is all about poetry and uses some of my old Hebrew poems, or fragments of them, in the narrative. Or you get stories like “High Windows,” which is inspired somewhat by the Larkin poem of that name. Poetry is the most powerful and the most true of any writing, and the hardest to do. To capture one single, perfect poem — say, Auden’s “Musée des Beaux Arts” — is something you could spend a lifetime chasing without success.